OK , so who really likes Basketball? Can you honestly say you could sit in front of the TV for two hours and be entertained lets say the way Hockey would entertain. Have you ever watched a Raptors game for two hours? Would you really get into the game Live for two hours basically waiting for the last 60 seconds of the game? I am not trying to take away from the Raptors good play, although they do belong in the worst Division in Basketball. Let's hear from all on your feelings about this game. I've said it before right here on this blog. There was a time when Vince was here that I would have picked a Raptor's Game over a Leafs game any day. They were way more exciting than watching the Leafs...especially live—and I'm a life-long Leafs fan. Live Leaf games can be such a bore. The crowd is too quiet with too many suits in attendance. When the Raptors are playing well, there is much more electricity at a game. The demographics of the crowd is different—and I don't mean race so much as socio-economic. There are more chances to get the crowd out of their seats to cheer. Some of that excitement is coming back with the way the current Raptor's team is playing. I love both teams and if both are playing, I will have a difficult time deciding between which to watch, I'll probably switch between the two depending on how they're doing. As I've also said here before, the demographics of this country are changing and hockey is losing ground to other sports. That trend will continue and I don't see much that can be done about it. I heard a story about a local principal on verge of losing their job because of going as Mr. T for Halloween and as you likely have guessed the costume included black face. I understand black face was a form of racism in cinema is the 50's/60's. However, since than has it ever been used to be racist? I am not black so I am aware I could speaking without proper knowledge. That being said, out side individuals alive during the 60's/70's has any ever experience black face used against them as a malicious attempt to hurt them? This principal should had been a bit smarter. In a job like that you have to be much more politically correct than 99% of other careers out there. I just come from the mindset that is there is no malicious intent behind it, what's the big deal? The guy was a fan of a character, I sure there wasn't a percentage of racist intent behind his actions. I know racism is till a big issue but this battle is not the one to fight IMO. This guy shouldn't lose his job. It's taking political correctness way too far. I don't think that statement was the problem per se, but specifically that he denied that women are institutionally raised to be passive. I don't really feel qualified to comment on that. Looking at the statement itself, I suppose someone could be offended by the idea that women still have to get into the "boy's club" to make it. They don't want to play the game, so to speak. I love basketball. I'd watch a basketball game over hockey any day of the week. I like the concept that the same players are on the court for most of the game. The back and forth is interesting and none of that neutral zone trap bore. When I travel I try and see games when I can. It's far more fun to watch a love game. Watching ice being cleaned between periods is about as exciting as watching ice being cleaned. I'm not a fan of Tory to begin with but its another case of hyper-sensitive people getting all bent out of shape about it. Many suspect a lot of the noise is coming from the Olivia Chow team (led by political weasel Warren Kinsella). Anyway, as for the advice, I'm sure Tory would tell young men the very same thing - in regards to succeeding in business. Its too bad merit can't be used instead of good old fashioned sucking up but then again Tory would know all about sucking up, wouldn't he? Margaret Wente has written an interesting article about Woody Allan in the Globe and Mail today. One of the things I didn't know was Soon-Yi was NOT Woodys adopted daughter or step daughter. Mia and her ex husband Andrew Previn adopted Soon-Yi before she met Woody. He also never married Mia nor lived with her even though they were together. The allegation of sexual abuse began to surface when Mia and Woody separated and began to fight for the for custody of their children. These allegations are a common tactic of lawyers in custody hearings. My sisters ex husband accused her of a cocaine addiction during their divorce and custody hearings. It was completely untrue and also didn't work. I'll watch an entire basketball game, no problem. I've probably seen 10 complete Raptors games this season so far. When you have a rooting interest, and your team is playing exciting basketball, a basketball game can be as fun as a hockey game. I mentioned this yesterday, but this Raptors team since the Rudy Gay trade is the most likeable Raptors team since just before Jorge Garbajosa got injured in 2007. Before that, we're talking Vince Carter, Antonio Davis and Charles Oakley. The current Raptors team is young, fun and plays as a team. Tory is clueless... something about him makes him unelectable. While I agree that the NBA style of basketball can be boring to watch until the end of most games, college games in the NCAA can get intense and riveting to watch, especially during the March Madness tournament. Do yourself a favor and take in one of those games this year. Sorry, man. Won't do it again. I love NCAA b-ball - way more than NBA. Like you said, more intense, the game usually lasts less than 2 hours, less attitude from the players and best of all, fewer TV commercials. @Argie, kidding around, but silly winky faces don't work here. I'm not Offended-with-a-capital-O. Hitting the $2,500 minimum is proving to be quite the challenge! Any assistance is appreciated. Fun times in Toronto sports! On the eve of another snowmageddon, I wanted to ask for some input/advice from the group. By way of a bit of background, I've spent the past 13 years at the helm of a successful marketing communications company (my own)- it's been amazing on many fronts. Now with our son away at university my priorities have changed. I've missed running projects from start to finish - and am interested in looking for a more fulsome position/projects to commit to (yes, I ended the sentence with a preposition and know it's wrong - talk about living dangerously). Here's the question - I would like to set up a blog to showcase my professional portfolio/story and am trying to figure out the best way to get this done. Would a Wordpress blog do the job - or is there a better way to go out this? I've done enough research to thoroughly confuse myself. Is there a blog format that lends itself better in a Mac environment? I appreciate all of your thoughts and advice. In other news, we live in the country and have a mailbox on a rural route road. Over the weekend the snow plow plucked the mailbox off its anchor and it's been flung into a farmers' field. Ditch digging isn't high on my agenda so I'll visit the post office every few days to collect our mail. Almost every mailbox on our concession road is missing - it's kind of funny looking, to be honest. More first world problems. I have to say I'm loving life in the Apple world - and there's absolutely no looking back. Even the guy selling HP's in Best Buy told me to go the Mac route. If you haven't already done so, take a minute to help Mike by donating to his crazy 40th bd ride. @Corey - I take my Cheerleading Responsibilities seriously. Let's help this madman get to the participation amount - at the very least. When my wife launched www.torontomommy.com recently, she used Wordpress. It was simple. Because you'll be working in a web browser, it doesn't really matter if you're updating on a Mac or Windows or Linux or whatever. You'll log into an administration site and manage everything there. Two prior failed interviews at Canwest pre-bankruptcy. (First was a supervisor hiring setup after NOT getting a call for a staff level role 6 months earlier - given to University qualified applicants. A shifty bonus third interview went to Atlantis Alliance 3-months before their buyout; CSI show's non-US accounting division dept. was sold back to CBS). Multiple previous year applications (with Corus), and I now despise Shaw/Corus for a few reasons - such as watching my elderly father grow numbed out, year by year, with its cable programs, while I can easily follow all the old time greats via Over-the-air only U.S. channels. 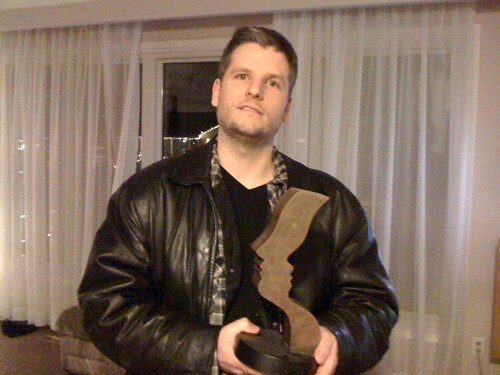 Here's where I wouldn't mind another posting of Mike with the Gemini Award. I know you've been looking for work for some time now. I can sense this process frustrates you. 1. Are you on LinkedIn? 2. Are you only pursuing jobs in your chosen industry or have you started looking for other opportunities? I'm trying to wrap my head around CQs comments. If I'm getting it, he's applied for positions at Canwest, Shaw and Corus in the past, but was unsuccessful. He now hates Corus and Shaw because his father watches too much cable TV and can't watch "old time greats" (what does that mean? Reruns of old shows not carried by Shaw?). Have I got it about right? CQ is against all cable companies, I guess, and doesn't want to work for one. Actually, I would be happier (?) with a newspaper division. I even wished for (gulp) Ford Motor Co. of Cda once a long ago. I'd be thrilled to work at any competition fighting U.S. media company. I posted a comparison of MeTV versus four Cdn channels in the Fall of 2011. It was approx. 55 to 15. Another great day of postings by CQ. I can tell you that if CQ speaks the same way he writes he will never get a job. Sometimes it's not the resume it's the woman/man that is the problem. Good luck job hunting CQ, perhaps you should take a high school night class in creative writing while you search for a job. @TorontoMike: Mike what's a good site or app if you need to send an anonymous email to a co-worker. I have an issue with someone that doesn't have anything to do with the actual work done, but their hygiene? I urge everyone to re-read this entry and the comments. The history of blackface conjures up an immense amount of all-to-recent racist history. Blackface, has a racist history, and when white people paint their faces black, it is always racist. I find this blackface topic fascinating. We should all understand the history of it and the obvious negative connotations, but let's talk about this very specific example. I have no idea why anyone, white OR black would dress up as Mr. T in the year 2014, but if he had worn the costume without makeup, people likely wouldn't have understood who he was supposed to be. Is there a distinction between a) blackface, which was as a means to reinforce negative stereotypes and derive entertainment from exaggerated portrayals and b) dressing up as a very specific well known celebrity who happens to be black? What if someone decided to dress up like Liberace or Justin Trudeau? Would that be considered offensive to gay people? Oh right, I forgot, JT is not gay (apparently). Damn I forgot. @Liz, another ringing endorsement for Wordpress. It's really great as a blog platform. @Liz: For sure, Wordpress. Google for "How to secure your wordpress install", which will point out which plugins & settings will keep it safe. Basically, enable Auto Updates, rename the Admin account to literally anything else + give it a strong password, install something like Wordfence or Limit Login Attempts to throttle hackers. @Rob I'm glad that story is getting attention overseas! I feel terrible for that VP. A costume and a good one I might add with no malicious intent and he gets in trouble. What a joke! Now a days it seems like no matter who you do, you'll offend someone. Yes, more snow as if we didn't have enough already. Well, my trainer was here today. He doesn't come Wednesdays, so as long as the roads are half decent on Thursday, that would be good. My trainer is still going to curl although just part time. He may just be filling in for people who can't make it to spiels. Well, his team will still exist so I will keep cheering for them. Maybe they will be good enough to beat Howard again next year. The team who beat Howard in the final was my trainer's friends so he is happy. As for basketball, I'm a Suns fan. I get their games on the net. Basketball is a fast game, the scores change lots. I do prefer hockey though. The thing about basketball is that they tend to call lots of timeouts in the end and I don't like that, but I like basketball a lot better than baseball any day. Is anybody optimistic on this blustery February day the Blue Jays will do something meaningful before the start of the season to improve the team, or should we be just cheering for one year closer to a real grass field? And now that the Leafs and Raptors are hot, and TFC made all those big signings, the Jays are a complete afterthought outside the diehards. Don't want to be a killjoy, but don't get too excited about TFC until they get a few games behind them. I'm sure I don't need to remind you that the experts we 're predicting the Jays would lead the east last season. Count me among the die hards. Don't care about hockey and the raptors have been a treat to watch but I cant wait for spring to roll around. Pitchers and catchers report in 2 weeks! I am optimistic they will sign one of Jimenez or Santana. I'd prefer Jimenez personally, love his sinker. The jays first round picks (9 and 11 overall) are protected to, so they'll only lose a second rounder as compensation. I think Arroyo is a back up plan. Last I heard he hasn't had any formal offers. Hopefully Hutchinson and Drabek are both able to comeback and contribute at a big league level. Stroman should arrive at some point this year too. Last season it seemed like everything that could go wrong, did go wrong. I don't think this team is nearly as bad as people make them out to be. Also wanna add a shout out to the Toronto Rock for those looking for winter sports entertainment. Tickets are reasonable and the games are a lot of fun. It's too bad they seem to be an after thought on the Toronto sports landscape. They're such an afterthought, I always forget they exist. I've never been to a Rock game and I've never had the urge to break that streak. The Sochi Olympics are shaping up to be the most entertains eva! Love "dangerous face water"! Give them a chance, I think you would be pleasantly surprised. The season runs through April and they play on weekends. At the very least you get a blog entry out of it. I'm sure there are a few close freinds in entertainment(podcasts without names)that could chip a few pesos for your cause. Been to a few Rock games the past 2 years & very entertaining with cheap seats & a LOT of giveaways. The kids love it. @ Ben Vidal did'nt know you needed to be a literary to post here! Did you specialize in literary criticism? Bet'cha thats a money maker! I'm off to see Country Rocker Jason Aldean this Friday at Copps in the Hammer with my son and daughter (belated Xmas gift to them). I have tried to buy tickets since day one, and it immediately sold out. Only way I got tickets was from Tickets Center from the states. Paid through the nose and many other body parts for these. Couldn't believe through my on line searching how many tickets are actually sold to these business's scalping them. Outrageous I say!! Oh well, I will enjoy the show and a chance to spend some time with my kids. @Mike from Lowville: Never said you have to be an English major. Heaven knows I make grammatical errors on here. CQ consistently complains about a lack of job or Toronto Mike's freebies. Which in and of itself is petty. The problem and I assume nearly all here would agree with is that he doesn't make sense when he writes. Most times I have to read and re-read his posts 2-3 times over. Curious... do many of you regularly go to concerts? Any coming up that you're looking forward to? I'm skipping Skinny Puppy because I hate Sound Academy. Also I have a personal grudge against their opener, Army of the Universe because the lead singer for some reason saw fit to slap me across the face from the stage when I saw them open for KMFDM. Their show is actually a make-good after they cancelled their event here last year, after being kidnapped and held for ransom by a Mexican cartel. Thinking about finally seeing Happy Mondays. I think it's awesome that Gaz moved to Burlington of all places. Maybe The Darcys again. Really excited for Gary Numan; I highly recommend his last album if you enjoyed Downward Spiral-era Nine Inch Nails. I managed to snag The Knife tickets. I should grab Mogwai ones. Being 50+, not too many concerts interest me. I like the outdoor venues, saw Rush a few years ago at the Molson Amphitheatre with my son. Would like to check out the boots and hearts concert at Mosport this summer, but weather is always unpredictable, given the cost of the tickets. I'm a big fan of Neko Case. She's currently on tour and will be playing Massey Hall in May. It's a perfect venue for her kind of music and tickets are quite reasonable. I'd love to go but there are other priorities in my life right now. I'm also over 40. Attending concerts is probably a thing of the past for me. How about those Habs. They won 2 to 0. That's great. My Coyotes lost though and so did my Suns. I don't go to concerts often at all. The reason is because they overdo the speakers. Earplugs don't work. It's still loud. I don't know why they have to be so loud, but they do and I want to keep my hearing. If I ever lose my hearing, I'll be in big trouble. @Markosaar: I enjoy a good concert. I don't go as much as I used to, but I think that's mainly because I've checked off my bucket list of bands I really want to see live. Now I find myself attending concerts for bands I've always loved or have enjoyed seeing before. Concertsin 2014 I've already purchased tickets for are Kings of Leon and Young the Giant. I'll probably pick up tickets to catch Dave Matthews Band especially as he's at the Amphitheatre. If Pearl Jam comes to town you can bet I'll be taking them in. My question back to you or anyone else is regarding Arcade Fire. I have tried and tried to like them. I've listened to their albums not once but several times over in an attempt to force myself to like them. In the end I find them overrated. I equate as the musical equivalent Arcade Fire to Madmen in being so overrated that I must be an idiot not to enjoy them. Funeral by Arcade Fire is just a brilliant album, though. My actual question was does anyone else find Arcade Fire extremely overrated? I don't, but whenever a band is praised the way Arcade Fire is praised there's bound to be many who deem them overrated. I don't like Mad Men. Arcade Fire does nothing for me, very shallow song writing and structure for my tastes, so for me, yes they are over rated. Shows I have seen or are planning to see to help me make through this wicked winter - Roseanne Cash and Band (She was great! ), Lake Street Dive, John Hiatt and Lyle Lovett, Garland Jeffries, John Hammond. I don't like Arcade Fire - then again, I don't like anybody. Seriously though, I also find them over-rated. However, I love Mumford & Sons and U2 so I obviously don't have any issues with popular bands. I'm probably in the minority here but I can't stand Mumford And Sons, Cold Play, Arcade Fire and Kings Of Leon. If I'm listening to the radio and they come on I change the channel. I can somewhat tolerate U2 depending on the song. Finding Arcade Fire overrated is itself overrated. I never heard of Arcade Fire or Mumford and Sons or Cold Play. Don't know any of those. Well, I bought a baby gift for Carter, my trainer's son. I ordered it. Hopefully it will arrive. I got him a bib. I got him a Leafs bib. I was going to get him a Habs bib. Hey, why not. He wouldn't know the difference as he's just a baby and it would be good if he had a good team, but my trainer says get him a Leafs bib so I relented and bought a Leafs bib. It will have Carter's name on it. It's probably the only Leafs thing I'll ever buy. As you know, I hate the Leafs most of all. There is no other team I hate more. re: Corey Feb 4th 13:36 & Toronto Mike 13:40. Pardon the response delay here. What's about right is that Shaw's divisions brought me out only for differing GAG interviews. Torstar's Digital Division tried the same trick this last summer; no grunt interview myself, only mentioned here versus Mike's recounting of turning aside an earlier leadership offer. Every tease interview (or job agencies' unprepared phone callbacks, for example) has costed me: hope, a stitch from worn down pride, and even the hard bus fare. 'Cut of a thousand knives' is accurate. No one inquires when or how it is done with. Unceased, the cuts become accumulated. It doesn't matter whether it is from one or a thousand different strangers. Being a stooge or a patsy, and knowingly taking it(!) is and was bad enough. Resenting an individual job or a boss is one level; this happens to many people. Hating an entire structure and being helpless to change it - besides falling away (or down) and giving up, is worse. That is when comfortable outsiders begin readily speaking of 'mental health issues' - of others. Toronto Mike has rarely endured this unsweetened side of life. Where he gets one sour example; I've had probably twenty. Likewise, the reverse; for every limited low hanging or false chance I've encountered; Mike will have brushed aside twenty supportive true opportunities - as his choice. Knowing a chasm, and understanding a chasm are two different scales. Yeah. I searched and applied for a fair variety of other jobs, btw. I know my aptitudes and skills; I also know of my non-aptitudes, limitations, and non-skills. Generally I exist in-between economic worlds, assumedly too 'priveledged' for general blue collar; and too 'no, not him' for still lowly paid white collar. I'd like to add Microsoft Canada as such a technology company I might have (IMO) formerly excelled at, pun intended. Ditto as to, for a non-profit example, public libraries. No LinkedIn. No contacts, no diploma (two yrs self-financed honours after an original falsied transcript) nor any certifications despite six (4, plus a separate 2) added years' career minded educ., no references / documented job promotions. Mike can automatically smile within a highly spotlighted, welcomed life. I have troubles and cruel minded (often) anonymous spoil sports in mine. As elvis once implied within these fair forum threads, "He has the e-mails. "; yet I had never contacted him. I really don't understand your situation, and especially why you're fixated on Mike. As an objective bystander, your comments about Mike seem very bizarre. Maybe instead of focussing on him and his successes, you need to start getting serious about achieving your own goals. Do you think I have a charmed life? I don't know my dad, I'm on my second marriage, I work every hard for everything I have. Anything good that's come to me is because I worked for it... luck had little to do with it. You honestly don't seem interested in helping yourself. For example, who looks for work without creating a LinkedIn profile? It's free and common sense. You can even find opportunities there, network and get discovered. Start helping yourself and good things will happen. That's the secret to my success. My Suns lost last night. This is not good. Oh well, my Habs and Coyotes will win tonight. That will be great. After Saturday, no hockey except Olympic hockey for over two weeks. My trainer did win his game on Tuesday. That's awesome. They'll probably win Major League again. I am excited about the Brier now that Howard isn't in it. Everyone cheer for Ontario in the Brier because Team Bice is my trainer's friends. I really want them to win it. I hope they will. I hope Martin or Stoughton doesn't win it. I want a young team to win the Brier so go Team Bice. I'm so glad no howard. Hopefully Howard retires next year. I heard they may. Thanks Corey. I guess Mumford and Sons are okay. I didn't care for that song though. I'm not going to rush out and buy any of their music. @Mike doesn't need anyone to defend him, but if you're going to post on his blog and he gives you free advice, I'd suggest you don't take personal shots at him. @CQ, I don't claim to understand your situation very well, but @Corey's advise about Job Start is bang on. I own a small business (unfortunately, we are not currently hiring) but we have hired people form Job Start in the past. They are a good job resource and with what I can piece of your credentials, they are probably a great place for you to get the resources and support you need in your job search. Get on LinkedIn as well, seriously, it's the second place I go to when looking over resumes.